This is the only comprehensive, authoritative guide to building Conversational User Interfaces (CUI, a.k.a. bots, chatbots, or chatterbots) with the Microsoft Bot Framework. Reflecting the next radical revolution in human-computer interaction, it will help you leverage advanced artificial intelligence (AI) and natural language processing to empower new and existing applications with stunningly intuitive conversational interfaces. Long-time Microsoft MVP Joe Mayo begins with high-level explanations of what Microsoft Bot Framework is, what you can do with it, and why it matters so much. Next, he presents the foundational knowledge you need to start creating real bots and CUIs. Step by step, you ll learn how to build message dialogs, manage conversations, interact with framework APIs, and incorporate powerful natural language processing with Microsoft advanced Language Understanding Intelligent Service (LUIS). Mayo also offers detailed guidance on deploying your customized bots to key platforms such as Slack, Skype, and Facebook Messenger. Throughout, Mayos practical examples combine code with clear explanations of when and why you would perform each task. 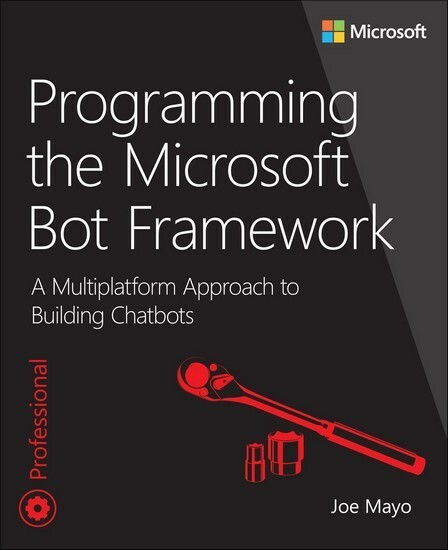 From start to finish, Programming the Microsoft Bot Framework is relentlessly practical, helping you translate the advanced "magic" of intelligent bots into real solutions right now.